Adora is a way of interpreting contemporary living, a careful examination of the rapid changes involving the taste of those who love luxury and live in a young, fast-paced and changing world. 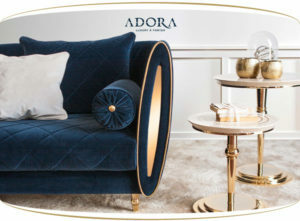 The Sipario collection, Adora's first creation, stands out for its basic and clean lines, its pastel shades skillfully combined with the more intense color, and the soft elegance of capitonné. Adora, Luxury à Porter, will be present at Salone Internazionale del Mobile 2016, in Milan. Come to visit our stand to discover more: Hall 2 - Stand G37 / L30.